After its dark stories involving Batman, Superman and Wonder Woman DC Comics brings us its most kid friendly Superhero to date in the form of Shazam. Pitched somewhere between the adult humour of Deadpool and the darkness of all the Batman stories Shazam could possibly be DCs’ best movie so far. Vowing to find his mother he rejects any home that he’s put into and constantly runs away. After he has a run in with the police Billy is placed with foster parents Victor and Rosa Vasquez (Cooper Andrews and Marta Milans) and their other five fostered children, Freddy (Jack Dylan Grazer), Mary (Grace Fulton), Pedro (Jovan Armand), Eugene (Ian Chen) and Darla (Faithe Herman). After Billy tries to save Freddy from bullies at school he finds himself in the lair of an ancient wizard called Shazam (Djimon Hounsou). The Wizard it would seem is looking for someone pure of heart who he can pass his powers too. Asking him to put his hand on his staff young Billy is suddenly transformed into muscular adult Superhero Shazam ((Zachary Levi). It doesn’t take long before Billy realises that he can change between the two personas by saying the word Shazam. However what is not so easy is his ability to manage his superpowers when he’s in his adult body, the middle section of the movie sees Shazam, sometimes hilariously, learning what powers the wizard has bestowed on him. As is the way with comic book characters for every superhero there’s an evil villain, in the case of Shazam his arch nemesis is Doctor Thaddeus (Mark Strong).Thaddeus after being rejected by the wizard Shazam, because he was not pure of heart, wants Shazam’s powers. 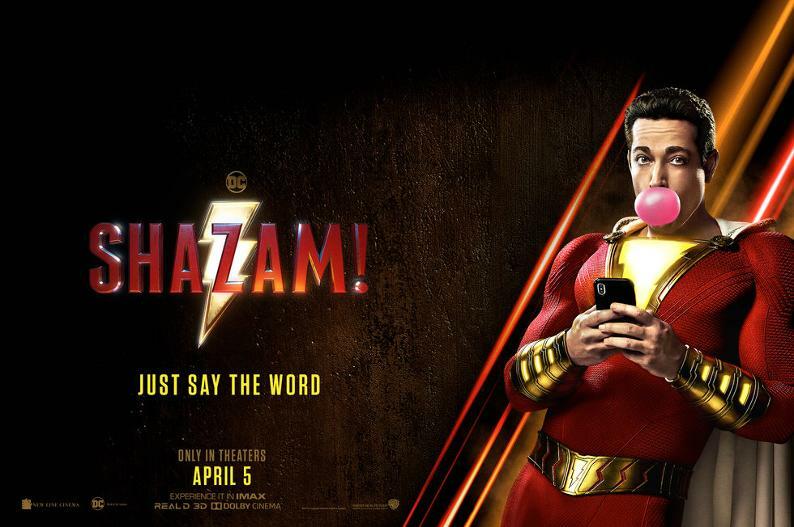 Shazam’s biggest plus point is that it doesn’t take itself too seriously striking just the right blend of humour and action. Levi is particularly good playing a child in a man’s body (there’s even a wink to the movie Big where Tom Hanks famously played a child in a man’s body).